This week is Dental Health Week (7th-13th August 2017) and EACH is inviting the local community to join us for a special event at our Ferntree Gully health centre on Wednesday 9th August 2017. We are hosting a range of activities aimed at promoting ‘Oral health for busy lives’. This year’s theme is Anywhere, Anytime. We live in a frantic world where making time for even our daily routines requires superhuman scheduling. The awareness campaign is encouraging everyone, no matter what stage of life they may be at, to set aside some time for their oral health. This significant message comes in response to results of a recent survey commissioned by the ADA (Australian Dental Association), which revealed that only 51% of Australians brush twice-a-day and only 35% visit their dentist at the recommended frequency. “Sometimes life gets very busy but this is a good reminder that good oral health is essential to your overall health and wellbeing, and that good habits need to start early in life,” Diana Brown Smiles 4 Miles Coordinator for EACH said. The Smiles 4 Miles program is an initiative of Dental Health Services Victoria which aims to improve the oral health of preschool aged children and their families by encouraging healthy eating, healthy drinking and good oral hygiene. 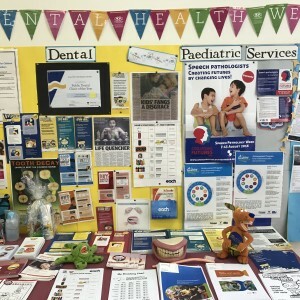 Our Dental Health Week event will include games and activities for kids and information and resources for the parents. In the afternoon there will be an award ceremony held to recognise preschools across Knox for their work in taking part in the Smiles 4 Miles initiative. EACH would like to invite people to drop in on our centre at 1063 Burwood Highway, Ferntree Gully any time on Wednesday 9th August 2017 to enjoy the free event. For information on the day, please contact Diana Brown – Smiles 4 Miles Coordinator at EACH on 97576209 or via diana.brown@each.com.au.